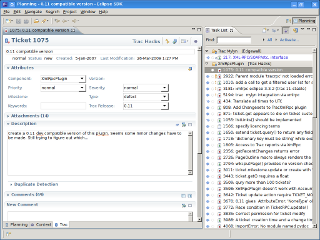 The Mylyn Trac Connector provides Eclipse integration for accessing Trac issues including offline editing and access to attachments. Connection to the repository is supported through Trac's XML-RPC Plugin (recommended) or through the web-interface (limited). Supported Trac versions: 0.11, 0.12. By adding the following code below to your website you will be able to add an install button for Mylyn Trac Connector.